Photo: KW and area's 2012 Athlete of the Year Tyler Miller (wheelchair basketball). 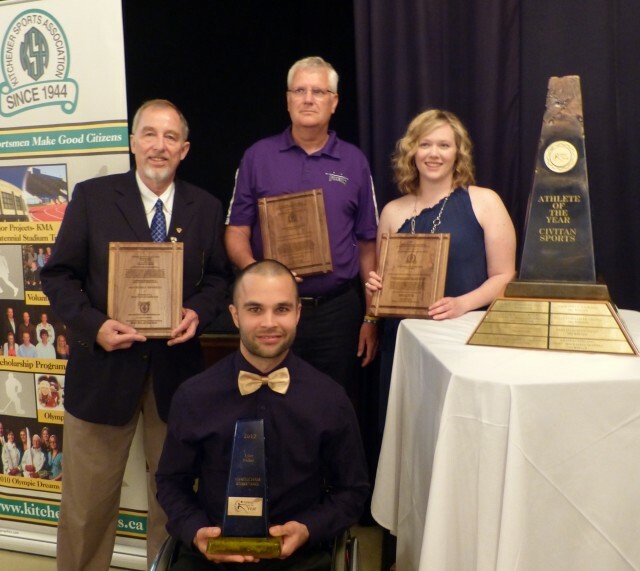 Standing behind Tyler are the recipients of the KSA Awards of Excellence (l-r): Gerhard Griebenow (Individual), Paul Pavan (Organization - The KW Predators Volleyball Club) and Shannon Costello (Team category - the Kitchener Dutchmen Jr. B. Hockey Team). The Awards of Excellence are formally presented at the Athlete of the Year event.